A great way to enhance your treatments with certain natural oils is through hot oil treatments. 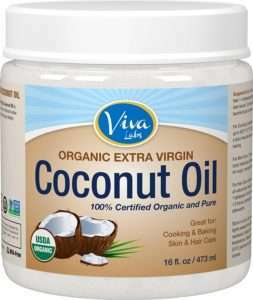 Hot oil treatments help achieve better penetration on hair. Usually, most people cover their hair with a disposable cap then wrap a wet hot towel around their head for 20 – 30 minutes. This is fine but a few months ago, I started eyeing a hair and facial steamer. Unfortunately, my budget was tight them so I looked around for a more economical option and discovered two handy hair steaming devices – the Hair Therapy Wrap and the Q-Redew Handheld Steamer. Is Steaming Good for Your Hair? Heat application allows any products you apply to your hair work even better. Hair steaming opens up your cuticles and allows the products to penetrate deeply into your hair shaft. The moist heat also hydrates dry hair and promotes circulation to the follicles. If you’ve never tried hair steaming, you’re missing out. It’s a real treat for all hair types. What is the Hair Therapy Wrap? 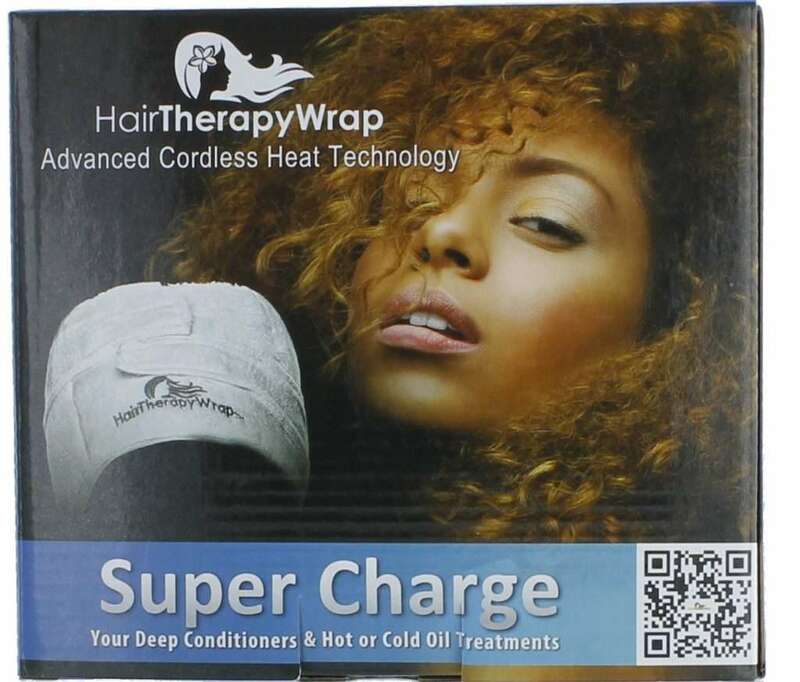 The Hair Therapy Wrap is a cordless thermal turban heat wrap that works by applying gentle heat to the hair. The wrap is heated via the gel packs contained in the box. The gel packs are inserted into the cotton cover and zipped up. The wrap is then placed in a microwave oven for up to 45 seconds. Once heated, you place the wrap over your head and secure with the attached fastening straps. After the Hair Therapy Wrap cools down, you can reheat for a further 30 – 35 seconds then turn around the wrap and secure to your head again. The hair therapy wrap package comes with the towel cover, 3 gel packs, 2 shower caps and detailed instructions. After massaging the oil into your hair and scalp, cover your hair with a disposable cap then place the hair therapy wrap over that and fasten. The Hair Therapy Wrap is small and handy. You can move about your business at home while wearing the Hair Therapy Wrap. It’s easy to remove the gel packs and clean the cloth. 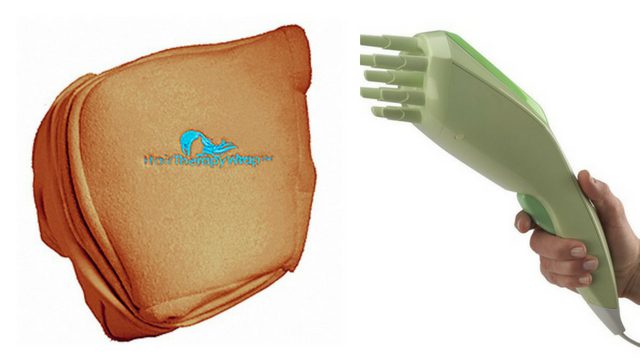 If you detest seating under a hot dryer or hair steamer, the hair therapy wrap is perfect for you. The hair therapy wrap consumes less energy, as it’s cordless. The Hair Therapy Wrap needs reheating after about 30 minutes. You need to turn the cap around to get the very back of your head. A minor inconvenience but some people might find it annoying. The gel packs need to be replaced eventually and they are not easy to find. In some cases, the gel packs inside the hair therapy wrap will need to be replaced. Unfortunately, the gel replacement packs are a bit difficult to replace but you can order it from Canada HERE. What is the Q-Redew Handheld Steamer? I discovered the Q-Redew Handheld Steamer a few weeks after I bought the Hair Therapy Wrap. 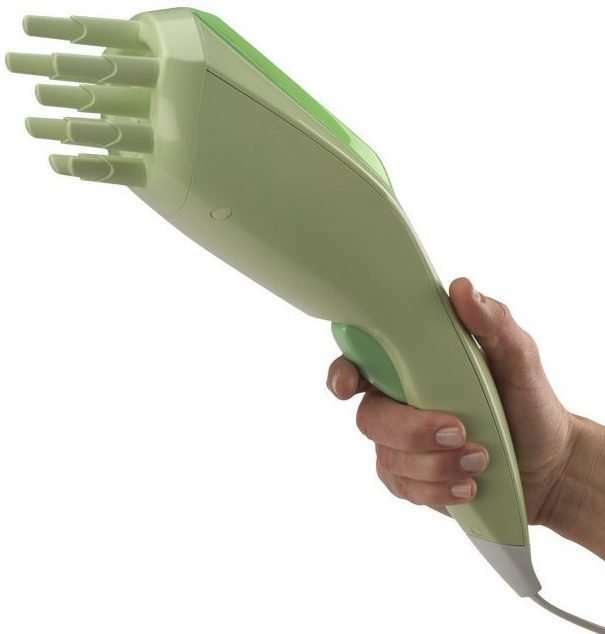 As the name suggests, the Q-Redew Handheld Steamer is a handheld steamer that is designed to hydrate, detangle, stretch, reshape and give hair an added moisture boost between full regimen days without the need to saturate hair completely with water. The Q-Redew Handheld Steamer was invented by Heidi, a curly-haired mother of three who wanted to fill a void in her own hair care routine. How Does the Q-Redew Handheld Steamer Work? The Q-Redew Handheld Steamer has a detachable water reservoir, which is filled with distilled water and reinserted. Afterward, the steamer is plugged in and heated up before pressing the trigger to activate the steam. As opposed to a full hot oil treatment, this is better for a quick steaming session. It works by adding warm steam in a mist form to the hair. The detachable water reservoir holds approximately 3 oz of distilled water, which least for approximately 10 minutes before the reservoir needs to be refilled. How to Use the Q-Redew Handheld Steamer Work? Apply a light coating of oil then run the steamer to your hair for a few minutes to dampen your whole head. Then reshape and style your hair accordingly. This is how I use it as well. The Q-Redew Handheld Steamer can be used in combination with hair gels, shampoos, and other hair products but only distilled water should be put in the reservoir. If it doesn’t seem like the steam is flowing freely then you may mineral deposits in the chamber. The Q-Redew team suggests diluting a teaspoon of white vinegar into the reservoir water then running it through the unit. The vinegar will clear the deposits and the steam will flow freely again. The Q-Redew Handheld Steamer is a great midweek moisture boost to reshape a style. If you’re on the road a lot, the Q-Redew Handheld Steamer is ideal for traveling without taking up too much space in your luggage. It’s affordable while saving up for a full-sized steamer. The Q-Redew Handheld Steamer provides continuous heat for at least 10 minutes before you need to refill but there’s no need to plug-in and reheat again. You don’t need to drench your hair with products. A light application is fine. If you prefer, you don’t have to apply any products at all for the handheld steamer to work. If you have any questions after purchasing the handheld steamers, feel free to send an email to Support@QRedew.com and they will be happy to answer any questions. The water compartment could be a bit bigger but that’s a minor annoyance. The handheld steamer is a tad pricey. When it comes to hot oil treatments, my favorites to use are coconut oil, olive oil, grape seed oil, castor oil and almond oil but you can try other oils as well. Check The Best Natural Oils for Hair Steaming for a breakdown of more oils you can use for hair steaming. 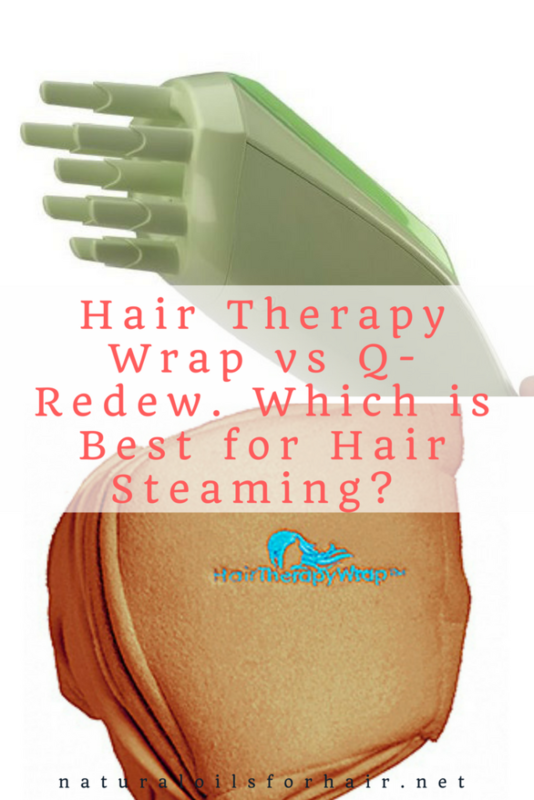 As great as they are, neither the Hair Therapy Wrap or the Q-Redew Handheld Hair Steamer can replace a traditional hood steamer but they both serve their own purposes if you travel a lot or have a minimal budget. Have you tried the Hair Therapy Wrap or the Q-Redew handheld steamer? Or both? What are your thoughts on this? Let me know in the comment section. Update: Since I wrote this article, I have also purchased a tabletop steamer which I love very much but on the days when I’m feeling lazy, the hair therapy wrap remains my go-to steaming tool. Read Portable Hair Steamers: A Look at the Best. The book is a guide which goes in-depth into which specific oil (s) works for each hair issues for optimal length and health. The hair therapy wrap looks interesting but I’ve been hearing things about the q-redew as well. The PJ in me is calling out for it. Thanks for listing the pros and cons of each. You don’t know the half of it. My PJ spirit comes and goes but mostly it’s coming. lol. If you already have the wrap, stick to that for some time before moving over to qredew. I have the hair therepahy wrap but I’ve been going back and forth on the q-redew for a few months. The PJ in me wants it but I’m not sure I need it. lol.